Exciting to create on, Fredrix Archival Watercolor Cotton Canvas is a revolutionary watercolor surface made of 100% cotton. It delivers a unique look that can only be captured on canvas, with superb lifting ability for easy washes and corrections. This innovative cotton canvas combines the texture of a natural, woven fabric with a specially formulated acid-free gesso designed for all waterbased paints. It's versatile and durable, too. 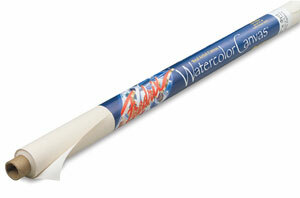 Scratch or scrape it for unique effects, and staple or rewet it without damaging the canvas.